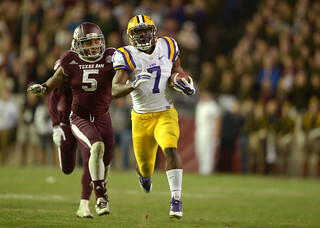 Coming out of high school Leonard Fournette was seen as the number one prospect in the country, just ahead of Jabrill Peppers, who will also be joining the ranks of first round draft picks in 2017.Fournette is a special talent and a punishing runner who has dominated the tough Southeastern Conference throughout his time at LSU. He’s generally seen as the number one running back in this year’s draft class, which is no small accomplishment in a draft that also include talents such as Dalvin Cook and Christian McCaffrey. However, what was not impressive was Leonard Fournette’s Wonderlic test score of 11 at the NFL scouting combine. That’s 11/50 questions right on the Wonderlic test, where the average for all running backs is about 20. Lucky for Fournette, there’s already a tremendous amount of other information from the NFL Combine to go along with the hype surrounding Fournette. What is the Wonderlic Test? It’s a 12 minute intelligence test consisting of 50 questions. NFL teams use the test along with many other professional organizations to gauge a person’s cognitive ability when faced with short time frames. To take the test yourself, try the quiz below. Can You Beat an 11? Find out! It doesn’t take an expert to realize that Fournette is a runner who cherishes contact, loves running over defenders and using a lethal stiff arm to punish undersized defenders in the secondary. Scouts have compared his old school running style to that of Earl Campbell, though his blend of power and speed has also occasionally led to whispers of Adrian Peterson. While that may all be a bit over the top, it will be interesting to see how he performs at this year’s NFL combine. Fournette passes the eye test without question, but it will be interesting to see how his strength and ability stacks up as well as what we see out of a Leonard Fournette Wonderlic score. Historically scouts don’t put too much stock in Wonderlic scores at the running back position, but a high score should only help solidify a spot near the top of the draft. The Wonderlic test is a timed 12 minute test consisting of 50 questions. This forces test takers to solve problems quickly if they plan to complete the test on time. It is a cognitive abilities test, meaning it is not an intelligence test like an IQ test. It is meant to measures a person’s ability to follow directions and think critically in a fast and effective way.